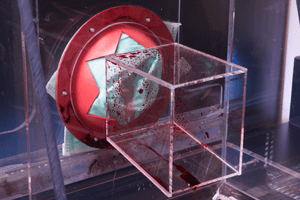 The Synthetic Blood Penetration – Splash Resistance test is one of two synthetic blood resistance tests offered by Nelson Labs to determine a product’s ability to act as a barrier to blood-borne pathogens. The Splash Resistance test method challenges medical face masks with a fixed volume of synthetic blood directed at high velocity at the center of the mask. This test is required by ASTM F2100 and is tested in compliance with ASTM Method F1862, ASTM F2100, and EN 14683. Nelson Labs’ highly experienced staff provides a one-stop shop for all ASTM F2100 and EN 14683 testing. 2 mL of synthetic blood is sprayed through a small cannula onto the surface of the face mask. At the conclusion of the test, the back side of the medical face mask is observed for synthetic blood penetration. Face masks can be evaluated at three different velocities corresponding to a human blood pressure of 80, 120, and 160 mm Hg. If the mask passes at the highest pressure, there is no need to test the mask at a lower pressure. A single sampling plan providing Acceptable Quality Level (AQL) of 4.0% would require that 32 masks be tested and that 29 of the 32 masks pass the test. The surface tension range for blood and body fluids is approximately 42 – 60 dynes/cm. To simulate the wetting characteristics, the synthetic blood is adjusted to the lower end of this range (40 ± 5 dynes/cm). If you have additional questions about Synthetic Blood Penetration testing, or would like to consult with the experts at Nelson Labs, just send us a request or call us at +1 (801) 290-7500.